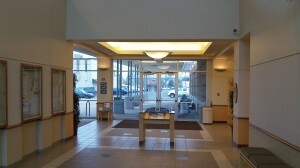 The lobby at City Hall, where an open house is coming up. If you are among those who grumble about the city government in Albany, a chance to talk to city officials face to face, without the formality of a public meeting, is close at hand. An open house is coming up at City Hall on Monday, Dec. 2, from 5:30 to 7 p.m. If past occasions like this are any guide, all the city departments will have displays set up, or tables, and employees will be on hand to talk to anyone who comes by. This may not seem all that riveting, but it’s instructive nevertheless. More important, though — once you’ve seen the demonstration of how well a police dog can sniff out drugs — is that members of the city council most likely will be there. So will the mayor. And you can talk to them about anything that’s on your mind. You can quiz them if, for example, you’re concerned about water rates, or why your street is falling apart and when it might be repaired, or what’s next in downtown urban renewal, and why, or how the rates are set under the city’s trash disposal franchise. Chances are you’ll learn something. Open houses serve one purpose only, to sell you something. They rarely result in productive change or action. If you want to learn how local government operates go to a Council meeting, especially if the agenda includes a decision to spend money. We, that is the “Cordier Cohorts”, had that opportunity last July 2012 before the outcome of the ballot election we worked hard on to have put to the ballot. There was the same poker faced and nodding head responses from the City Council as I suspected there would be. It all leaves me with the feeling of, “What’s the use..” J.E.